W.I.C. by Herôme had released their new Limited Edition collection Fancy Sweden. This collection consists of six shades: What I love about this collection is the variety of shades and finishes. The formula of all is good which made the application very easy. All my swatches are finished with one coat of Seche Vite. All the pictures are taken in daylight. Orebro, a soft light blue cream with very fine silver shimmer (2 coats). Malmo, a soft mint green cream (2 coats). Uppsala, a soft velvet pink with fine silver shimmer. This polish seems more orange than pink on me (2 coats). Gothenburg, a petrol blue cream with lots of greyish undertones (2 coats). Stockholm, a bright blue jelly-ish cream (2 coats). This could be a one-coater, but because of the jelly-ish formula I’ve used two. Love love love! This collection is now available for €7,50 each, or two for €12,50. You can get your favorite(s)at the drugstore or through their website. My favorites are Helsingborg, Stockholm and Orebro. Which one(s) caught your attention? 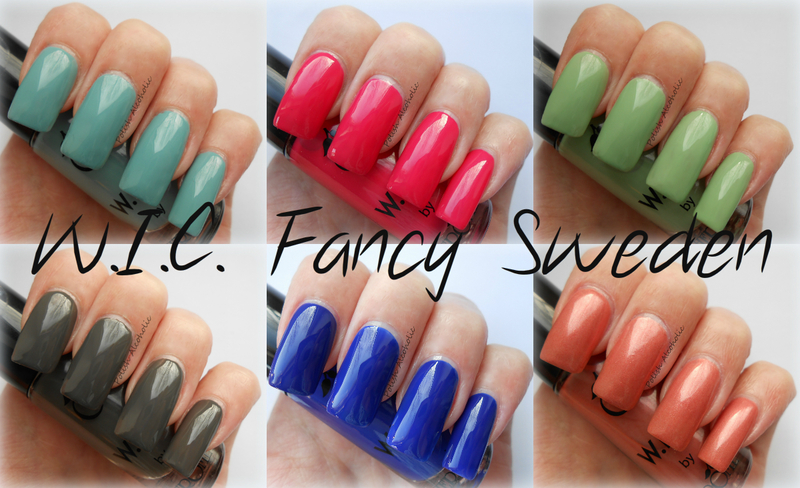 This entry was posted in Herôme and tagged fancy sweden, fancy sweden swatches, herome fancy sweden, review, swatch, swatches, wic by herome fancy sweden, wic fancy sweden, wic gothenburg, wic helsingborg, wic malmo, wic orebo, wic stockholm, wic uppsala by Polish Alcoholic. Bookmark the permalink. the way the light is reflected (especially in the green) looks like leaves! i thought that was a design at first! 😛 very pretty! How much product is in these bottles Sabrina? ml? ❤ Helsinki and Uppsala is must haves…. but jikes, they where expensive though ..